OzTorah » Blog Archive » Shirat HaYam: Miriam’s Song? The following article by Rabbi Dr Raymond Apple appeared in The Jewish Bible Quarterly, Vol. 45, no. 2, April-June 2017. 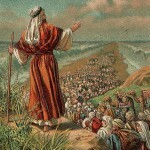 The Song of the Sea, Shirat HaYam (Exodus 15), has pride of place among Biblical poetry. According to the aggadists, the Bible contains many songs but only one Shirah, one Song “par excellence” (Mechilta Shirata 1). This Shirah is not only read from the Torah on Shabbat Parashat B’shallach – known as Shabbat Shirah – but also on the seventh day of Passover (BT Megillah 31a; Rashi on Ex. 14:5). It is also recited in the daily Shacharit at the end of the p’sukei d’zimrah (“passages of song”) (Zohar II:54b, Machzor Vitry). It is highly esteemed for at least two reasons, historical and theological. It depicts the crossing of Yam Suf, a major epic in biblical history, and shows how God protects His people, working miracles when necessary (Tanya, Sha’ar HaYichud 2). On the surface, the Shirah was composed by Moses (Ex. 15:1), but Carol Meyers and others argue that its content is more likely to be the work of women than of men. Additionally, fragments from the Dead Sea Scrolls indicate that the contribution of Miriam may be much greater than has been acknowledged. The present paper examines both of these assertions. The Shirah is a song of triumph. Pharaoh and God have been in conflict about whether and how the Israelite slaves would escape and emerge into freedom. The celebration poem when Pharaoh is defeated is one of a number of biblical war songs, some of which were apparently collated in the now lost Book of the Wars of the Lord and the Book of the Upright (Num. 21:14, Josh. 10:12-13). Numbers 21 contains such a war song in verses 27-30. It is the norm that the male warriors were welcomed home with great ceremony and song by their community. This kind of singing was a regular womanly activity. Such women’s welcomes to their men include the celebration with a bitter end with which Jephthah’s daughter welcomed her father home (Judg. 11:32-34) and the celebration of David’s victories over the Philistines (I Sam. 18:7). In all these cases the men had been away at war, with the women at home. The Shirah can be seen as part of this genre, typical of the way in which women conducted post-war jubilation. In these songs there is a leader of the celebration (Miriam), supported by a group of female musicians, musical instruments, and dancing to a melodic refrain. But there is a difference with the Red Sea episode. Here the struggle did not involve warriors fighting away from home. Both men and women were present during the incident, but without direct personal involvement. The fighting was done by God – “The Lord, the Warrior – Lord is His name (Ex. 15:3); Your right hand, O Lord, glorious in power, Your right hand, O Lord, shatters the foe!” (Ex. 15:6). This particular celebratory song focuses on God, the “warrior” here, rather than the menfolk. Although celebratory singing was generally in the women’s domain, the Shirah seems to be an exception. This is seen in the sequence of the two parts of the Song – the second and shorter one led by Miriam, the first and longer led by Moses, with both using the same three clause-refrain (“Sing to the Lord, He has triumphed gloriously, Horse and rider He has hurled into the sea”). From the structure of the text of the Bible itself we get the impression that the poet/leader was Moses and everyone first sang in unison or responsively, then Miriam and the women followed (verses 20-21) with a separate song or refrain. What commends this view is its simplicity and neat explanation of the terms az, shiru and ashirah. But it has its drawbacks. Why would the Bible place the Moses version before Miriam’s song if it took place afterwards? According to Abrahams’ theory, it is part of a tendency to elevate the rank of Moses. As Heschel noted, the Bible seems “to minimise the prophetic gifts of Aaron and Miriam.” Placing Moses before Miriam in the Song of the Sea enhances Moses’s prophetic standing. Thus, the Song could be the Song of Miriam more than that of Moses, and would be just the first of the long songs composed by women in the Bible, like the song of Deborah (Judg. 5:1-31) and the song of Hannah (I Sam. 2:1-20). This represents a song understood to have been composed by Miriam with some similarity to the Song of the Sea but not identical to it. It is evidence of an approach that expanded Miriam’s singing role rather than minimising it as found in the Bible. We have seen that the Song of the Sea is part of a genre of celebratory war songs generally associated with female authorship. Additionally, there is a possibility that the Biblical text transposed the songs of Moses and Miriam in order to give more prominence to Moses even though his song was in fact shorter and a response to the first song. Miriam may have played a larger role in this song than is seen at first glance, an expanded role reflected in a fragment from the Dead Sea Scrolls as well. 1. Carol Meyers, Exodus (The New Cambridge Bible Commentary) (New York: Cambridge University Press, 2005), pp. 116-123. 2. LH Schiffman & JC VanderKam, eds., Encyclopedia of the Dead Sea Scrolls (Oxford: Oxford UP, 2000), vol. 1, pp. 566-7 (s.v. ‘Miriam’); George J. Brooke, ‘Another Miriam’s Song: An Ancient Celebration of the Exodus with a Mixed Chorus’, in Biblical Archaeology Review (Biblical Archaeology Society, May/June, 1994); Hanna Tervanotko, ‘The Hope of the Enemy has Perished: The Figure of Miriam in the Qumran Library’, in Armin Lange, Matthias Weigold and Jozsef Zsengeller, eds., From Qumran to Aleppo: A Discussion with Emanuel Tov about the Textual History of Jewish Scripture (Gottingen, Germany: Vandenhoeck & Ruprecht, 2009); Sidnie White Crawford, ‘Traditions about Miriam in the Qumran Scrolls’ (Lincoln, Nebraska: Faculty Publications, Classics and Religious Studies, University of Nebraska-Lincoln, 2003). 3. Israel Abrahams, Poetry and Religion (London: George Allen & Unwin, 1920), pp. 49-51. 4. Rabbinic commentaries on Exodus 15:1; Mechilta Shirata 1. 6. Abraham Joshua Heschel, The Prophets (Philadelphia: Jewish Publication Society, 1962), p. 461. 8. Crawford, op. cit., p. 36. This entry is filed under Articles, Bible/Tanach, Festivals & Fasts, Interfaith Issues, Pesach.